Donepezil (also misspelled donezepil), marketed under the trade name Aricept by its developer Eisai and partner Pfizer, is a centrally acting reversible acetylcholinesterase inhibitor. Its main therapeutic use is in the treatment of Alzheimer's disease where it is used to increase cortical acetylcholine. Its binding to the acetylcholinesterase can be seen at Proteopedia 1eve. It has an oral bioavailability of 100% and easily crosses the blood-brain barrier. Because it has a half life of about 70 hours, it can be taken once a day. Initial dose is 5 mg per day, which can be increased to 10 mg per day after an adjustment period of at least 4 weeks. Currently, there is no definitive proof that use of donepezil or other similar agents alters the course or progression of Alzheimer's disease. However, 6-12 month controlled studies have shown modest benefits in cognition and/or behavior, such as one published in 1999. Pilot studies have reported that donepezil therapy may potentially have effects on markers of disease progression, such as hippocampal volume. Therefore, many neurologists, psychiatrists, and primary care physicians use donepezil in patients with Alzheimer's disease. In 2005, the UK National Institute for Clinical Excellence (NICE) withdrew its recommendation for use of the drug for mild-to-moderate AD, on the basis that there is no significant improvement in functional outcome; of quality of life or of behavioral symptoms. However, NICE revised its guidelines to suggest that donepezil be used in moderate stage patients for whom the evidence is strongest. Birks J, Harvey RJ (2006). "Donepezil for dementia due to Alzheimer's disease". Cochrane Database Syst Rev (1): CD001190. Steele LS, Glazier RH (April 1999). "Is donepezil effective for treating Alzheimer's disease?". Can Fam Physician 45: 917-9. "Drug 'treats severe Alzheimer's'". http://news.bbc.co.uk/2/hi/health/4832574.stm. Rojas-Fernandez CH (February 2001). "Successful use of donepezil for the treatment of dementia with Lewy bodies". Ann Pharmacother 35 (2): 202-5. http://www.theannals.com/cgi/pmidlookup?view=long&pmid=11215841. Malouf R, Birks J (2004). "Donepezil for vascular cognitive impairment". Cochrane Database Syst Rev (1): CD004395. Moraes W, Poyares D, Sukys-Claudino L, Guilleminault C, Tufik S (March 2008). "Donepezil improves obstructive sleep apnea in Alzheimer disease: a double-blind, placebo-controlled study". Chest 133 (3): 677-83. 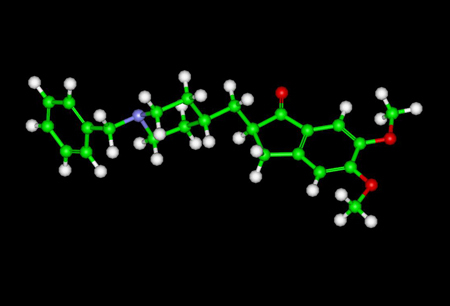 "Alzheimer's Drug Shows Promise As Treatment for Autism -- Arehart-Treichel". pn.psychiatryonline.org. 2001-11-16. http://pn.psychiatryonline.org/cgi/content/full/36/22/16-a. Benazzi F (November 1999). "Mania associated with donepezil". J Psychiatry Neurosci 24 (5): 468-9. Yesavage JA, Mumenthaler MS, Taylor JL, et al. (2002). "Donepezil and flight simulator performance: effects on retention of complex skills". Neurology 59 (1): 123-5.